In the film Letters to Juliet, the character Sophie becomes mesmerised by the wall of letters in Juliet Capulet’s Courtyard, where people come from all over the world to write their burning question about their romantic dilemma, which is answered diligently by the secretaries of Juliet. Behind a brick in the wall Sophie finds an unanswered letter written fifty years ago by a 16 year old English girl called Claire who had fallen in love with a young Italian boy called Lorenzo, Claire’s parent’s were taking her back to England and away from her Lorenzo, she wrote to Juliet asking her advice on what to do. Sophie writes to Claire and poses the question ‘What If? The letter resonates with Claire and brings her back to Italy fifty years later in search of her Lorenzo and both women are swept along in a romantic venture that neither could ever have imagined. 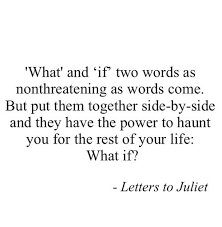 Sophie’s letter began: ‘What If?’ What and If are two words that are as non-threatening as words can be, but put them together side by side and they have the power to haunt you for the rest of your life’. It’s a question I pose to my clients when they’re considering a change in their current circumstances to allow them to move away from a career that is uninspiring and de-motivating for them, to follow a career path that allows them to be more fulfilled and energised in their work and their life. In essence they’re looking for their Lorenzo, some will know what the Lorenzo of their career and life is, while others will discover it along the way. Either way in a similar way to Claire they will need the courage to follow their heart and metaphorically speaking cross oceans to achieve their dreams, and while they don’t always know where their story will end, the important thing is to know that it’s never too late to be true to themselves in their quest for happiness in their career and life. I leave you today with just one question: What is the Lorenzo of your career, life and happiness? Previous PostWhat does my Nespresso Machine have to do with Evolving Careers? – by which I mean your Career EvolvingNext PostDo speculative job applications actually work?